20 consecutive patients with colorectal cancer (median age: 60.4 years, range 45.5-73.9 years) received bevacizumab intravenously (5 mg/kg) uncoupled of chemotherapy. Prior to and within the first 24 hours after bevacizumab infusion, patients were investigated for retinal endothelial function. A series of a triple 24-hour ambulatory blood pressure measurement was conducted. Retinal endothelial function was determined as flicker light-induced vasodilation. The integrity of baroreflex arc and autonomic cardiovascular control was examined by stimulatory manoeuvres. Bevacizumab therapy significantly reduced the vasodilatory capacity of retinal arterioles in response to flicker light. A slight decrease in diastolic pressure and heart rate was observed after bevacizumab infusion but this was unrelated to changes in retinal function. The pressure response upon nitroglycerin was largely preserved after bevacizumab infusion. The proportion of patients with abnormal nocturnal blood pressure regulation increased under anti-angiogenic therapy. Autonomic blood pressure control was not affected by bevacizumab treatment. Bevacizumab acutely impairs microvascular function independent of blood pressure changes. Imaging of the retinal microcirculation seems a valuable tool for monitoring pharmacodynamic effects of bevacizumab. Vascular endothelial growth factor (VEGF) is a key mediator of physiological and pathological angiogenesis. As all solid tumors are dependent on pathological angiogenesis, anti-VEGF therapy has been approved in various advanced and metastatic cancer types [1, 2]. The rationale for treating cancer patients with angiogenesis inhibitors has been on the assumption that unlike in tumor vessels survival and functioning of the normal vasculature is largely independent of VEGF signalling . Although clinical trials have proven the clinical benefit of bevacizumab and other angiogenesis inhibitors for the treatment of advanced cancers [1, 2, 4, 5], their use has been associated with hypertension and thromboembolic events [5–8]. Several mechanisms of the underlying cardiovascular toxicity have been proposed including the inhibition of vasomotor effects by VEGF but also structural and functional microvascular rarefaction [9–11]. Accordingly, changes in endothelial function have been observed in cancer patients treated by angiogenesis inhibitors [10, 11] and may serve as an important clinical marker for cardiovascular complications and therapy outcome. This hypothesis is corroborated by multiple clinical trials showing an association between bevacizumab-induced hypertension and response to therapy . Here, we investigated the acute impact of bevacizumab administration on retinal vessel reactivity in relation to acute changes of cardiovascular regulation inclusive blood pressure using the dynamic retinal vessel analysis and evaluation of the autonomic nervous system. We hypothesised that the dynamic retinal vessel analysis represents a useful non-invasive and easy applicable tool to monitor functional microvascular alterations following VEGF inhibition. All measurements were performed in a temperature and humidity controlled specialized autonomic laboratory. Consumption of caffeine or other xanthine containing foods were not permitted on the examination day. Alcohol and tobacco usage was ceased at the day preceding the measurements. For continuous cardiovascular monitoring using the SUEMPATHY device (Suess Medizin-Technik, Aue, Germany) including the non-invasive blood pressure monitoring CBM3000 device (Nihon Colin Co, Komaki, Japan) the patient was placed in the supine position on a tilt table . After a resting period of 20 minutes the following manoeuvres were performed. First blood pressure and heart rate responses to sublingual administration of 400 μg glyceroltrinitrate (Nitrolingual® akut Spray, Pohl Boskamp, Hohenlockstedt, Germany) were recorded for five minutes followed by deep metronomic breathing at a rate of six breaths per minute for two minutes. For evaluation of orthostatic reaction, patients were tilted to a 60° upright position for 15 minutes. After 10 minutes of head-up tilting, 400 μg glyceroltrinitrate was repeatedly administered while tilting was continued for another five minutes. During head-up tilting the subsequent decrease in ventricular filling and stroke volume evokes a transient fall in arterial pressure which is counter-regulated by the baroreflex arc with resultant tachycardia (vagal withdrawal) and vasoconstriction (sympathetic activation). This reaction is amplified by the application of vasodilatory agents such as glyceroltrinitrate. Orthostatic hypotension may occur as a result of sympathetic dysfunction which is defined as a reduction in systolic blood pressure of at least 20 mmHg and/or diastolic pressure of at least 10 mmHg within three minutes of upright tilt . The Dynamic Retinal Vessel Analyzer (DVA, IMEDOS GmbH, Jena, Germany) was used for digital fundus imaging to perform static and dynamic retinal vessel analysis. Thirty minutes after initiation of mydriasis of the right pupil using 1% tropicamide eye drops, each participant underwent seven-field fundus photography using the system Visualis (IMEDOS, FF450plus, 535–561 nm, 30° image, 1840×1360 pixel) as previously described . The arteriolar-to-venular ratio (AVR) was calculated from the central retinal arterial and venous equivalents to quantify generalized arterial narrowing. Dynamic vessel analysis was performed allowing non-invasive diagnosis of microvascular function by measuring the diameter of retinal arteries and veins continuously [16, 17]. An optoelectronic shutter was inserted in the retinal camera which interrupted the observation light with a frequency of 12.5 Hz. The baseline diameter was measured for 30 seconds in continuous light followed by three cycles of 20-second flicker provocation and 50-second steady fundus illumination. An arterial and venous segment of approximately 1.5 mm length was subsequently evaluated. An interval of 30 seconds before each flicker stimulation was considered as baseline to which the subsequent diameter response was normalised. The peak dilation was the largest vessel diameter at the end of each flicker stimulation averaged across three flicker periods. Changes in ocular hemodynamic parameters were expressed as percent change over baseline values. Validated automated 24-hour blood pressure devices (Boso GmbH, Jungingen, Germany) fulfilling the accuracy criteria of the Association for the Advancement of Medical Instrumentation were used to measure blood pressure and heart rate at intervals of 15 minutes at daytime (6–22 hours) and of 30 minutes at night (22–6 hours) at three different occasions. For each 24-hour measurement, blood pressures were evaluated separately for daytime and nighttime phases. Arterial daytime hypertension was diagnosed according to the criteria of the European Society of Hypertension (systolic blood pressure ≥ 140 mmHg and/or diastolic blood pressure ≥ 90 mmHg). Nocturnal hypertension was defined according to the guidelines of the American Hypertension Association (systolic blood pressure > 120 mmHg and diastolic blood pressure > 75 mmHg). A non-dipping blood pressure profile was existent when the nocturnal blood pressure fall was less than 10% of daytime values [18, 19]. Frequency analysis allows for quantification of cardiovascular regulation by assessing spontaneous oscillations in systemic arterial pressure and heart rate. Multiple trigonometric regressive spectral analysis (MTRS, ANS Consult, Freital, Germany) was applied to corresponding values of systolic blood pressure and of R-R interval derived from electrocardiogram. A non-artifactual global data segment of 2 min was analyzed. The local time window was set at 30 seconds and was shifted beat by beat for temporal determination of frequency and amplitude [20, 21]. Two main spectral bands are usually considered: High frequency (HF) oscillations (spectral band between 0.15 and 0.4 Hz) of heart rate relate to respiratory sinus arrhythmia and, therefore, to parasympathetic cardiovagal tone. The other oscillation of interest is in the low-frequency range (spectral band between 0.04 and 0.15 Hz), usually centred around 0.1 Hz (six cycles min-1). Low-frequency oscillations of heart rate (LF R-R) are thought to reflect the baroreflex-mediated adjustments to the sinus node while LF variations of systolic blood pressure are primarily the result of sympathetically mediated fluctuations in peripheral vasomotor tone. The LF/HF ratio allows for quantification of the relation between the two branches of the autonomic nervous system. The total spectral power describes the amount of variability of a signal or stochastic process at a specific frequency. Baroreflex sensitivity was calculated as the slope of the linear regression line of coherent pairs of the detected oscillations of R-R interval and systolic blood pressure (cross correlation coefficient > 0.7) [20, 22, 23]. The estimation of a global BRS index was based on the weighted mean of all 300–500 individual BRS values derived from all local data segments analysed according to a variance ratio: (variance reduction of RRI/ variance reduction of SBP)2. The SPSS package version 17.0 (SPSS Inc., Chicago, IL, USA) was used for all statistical computations. Data are expressed as mean and standard deviation or quartiles. Assuming non-Gaussian distribution, the acute effects of bevacizumab treatment on hemodynamic parameters were analyzed using Wilcoxon and Friedman Test. Spearman correlation coefficients were calculated between changes of continuous variables. Nominal data were compared by Fisher’s exact test using cross-tabulation. The overall survival of patients was calculated by the methods of Kaplan-Meier. Patients alive were censored at the day of last contact. A two-tailed p-value of < 0.05 was used to indicate significance. Twenty patients (15 men and 5 women) were enrolled into the study. Eleven patients had rectal and nine colon cancer. The median age was 60.4 [range 45.5-73.9] years. Overall survival of all patients was 23.5 [15.0 – 31.8] months (median [95% CI]). Patients receiving bevacizumab as first line treatment (n = 9) had an average survival of 27.1 [21.8 – 32.4] months and those receiving the antibody as second line treatment (n = 11) survived on average 21.2 [14.0 – 28.5] months. Static retinal vessel analysis revealed that there was no arteriolar narrowing based on age-normalised reference values of the ARIC (Atherosclerosis Risk in Communities) population. With bevacizumab, no change was observed for arterial diameter, but there was a trend towards a smaller venous diameter (day-1: 146 ± 22 μm vs. day+1: 143 ± 22 μm, p = 0.062, Figure 1a) resulting in a significantly increased AVR after bevacizumab administration (day-1: 0.89 ± 0.07 vs. day+1: 0.92 ± 0.06, p = 0.027, Figure 1b). 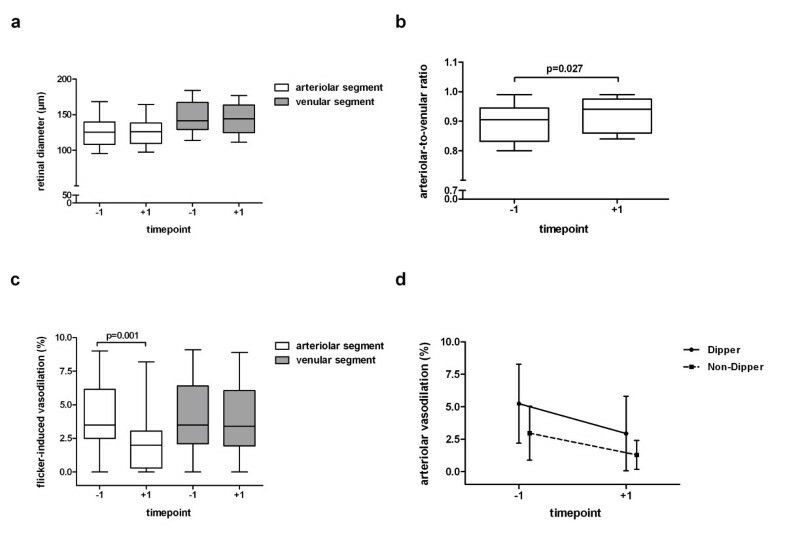 The arterial response to flicker provocation deteriorated from 4.2 ± 2.7% to 2.2 ± 2.2% within 24 hours of VEGF inhibition while maximal venous dilation remained unaffected (Figure 1c). a-d Functional and structural changes of retinal vessels in colorectal cancer patients in response to bevacizumab infusion. While the diameter of retinal vessels were unaffected by bevacizumab treatment (Figure 1 a) it evoked an increase in arteriolar-to-venular ratio (Figure 1 b) and a decrease in flicker-induced arterial vasodilation (Figure 1 c). The reactivity of retinal arteries to flickering light tended to be lower in patients with a pathological nocturnal blood pressure profile (non-dippers) than in those with physiological nocturnal blood pressure profile (dippers) (Figure 1 d). Legend: before (day-1) and after (day + 1) bevacizumab infusion. The profiles of 24-h ABPM over three recording days are depicted in Figures 2a and 2b. There was a significant reduction of diastolic pressure after bevacizumab administration (Figure 2a). Twenty-four hour heart rate steadily decreased over time (day -1: 80 ± 12 bpm; day 0: 76 ± 11 bpm; day +1: 74 ± 12 bpm; Friedman p = 0.047). All other parameters were not affected by bevacizumab. There was a trend towards a higher proportion of patients with a hypertensive blood pressure profile under VEGF inhibition (Figure 2c). The proportion of patients with non-dipping blood pressure at night increased continuously over the three recording days (Figure 2d). Although not statistically significant, there was a trend towards a lower retinal arterial reactivity in non-dippers versus dippers irrespective of bevacizumab infusion (p > 0.05, Figure 1d). Decrements of diastolic blood pressure from day 0 to day +1 were neither associated with changes in retinal vascular function (r = -0.250, p = 0.332) nor with AVR (r = -0.422, p = 0.298). a-d 24-h ambulatory blood pressure profiles in colorectal cancer patients in response to bevacizumab infusion. Diastolic blood pressure during daytime but not during nighttime decreased after bevacizumab infusion (Figure 2 a,b). The proportion of individuals with pathological blood pressure profile increased after bevacizumab (Figure 2 c,d). Legend: systolic blood pressure (broken lines), diastolic blood pressure (smooth lines); proportions are based on the diagnostic criteria of the European Society of Hypertension and the American Hypertension Association before (day-1), during (day 0) and after (day+1) bevacizumab infusion. Sublingual nitroglycerin (Nitro) evoked similar decreases in systolic blood pressure before and after bevacizumab infusion during supine (rest vs. nitro: p = 0.001 at day-1, p = 0.001 at day+1) and upright position (rest vs. +nitro: p = 0.001 at day-1, p = 0.002 at day+1) (Figure 3a). 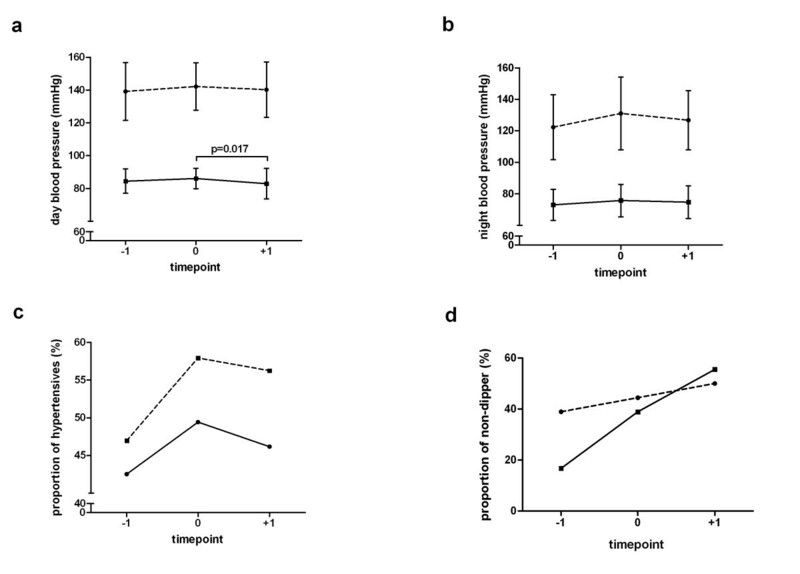 The nitroglycerin-mediated fall in diastolic blood pressure during head-up tilt (+nitro) was diminished after bevacizumab treatment (rest vs. +nitro, p = 0.002 at day-1; p > 0.05 at day+1). Controlled breathing at six cycles per min resulted in shifts from high to low frequency oscillations of R-R interval (LF/HF ratio of R-R interval: p = 0.010 at day -1; p = 0.006 at day+1) which was not accompanied by adequate adjustments in cardiovagal baroreflex sensitivity (Figure 3b) as observed in healthy individuals . Orthostatic challenge induced significant increases in low frequency oscillations of R-R interval (p = 0.003 at day-1; p = 0.004 at day+1) which were paralleled by an expected decrease in baroreflex sensitivity (p = 0.001 at day-1; p = 0.003 at day+1). Cardiovagal outflow as indexed by high frequency oscillations of R-R interval remained unchanged during orthostasis. Bevacizumab treatment did not modify autonomic adjustments of blood pressure control during cardiovascular perturbation. a-b Blood pressures and frequency bands of R-R interval during autonomic testing in response to bevacizumab infusion. The blood pressure response to the vasodilator nitroglycerin was largely preserved except for diastolic blood pressure during passive standing (Figure 3 a). 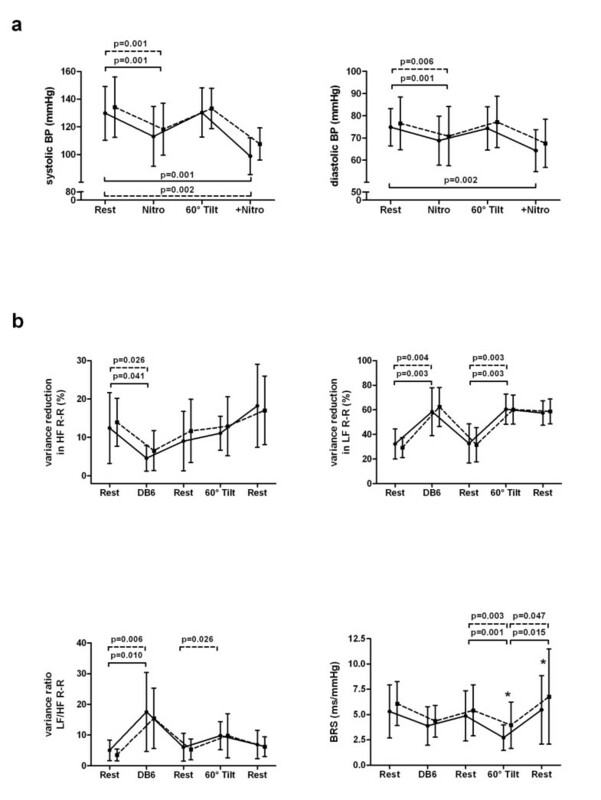 Cardiovascular perturbation by deep breathing and head-up tilt evoked a physiological shift from high to low frequency oscillations in R-R interval which was unaffected by bevacizumab treatment (Figure 3 b). Adequate adjustments of baroreflex sensitivity were only observed in response to postural change but not to deep breathing irrespective of bevacizumab treatment. Legend: BP, blood pressure; BRS, baroreflex sensitivity; DB6, deep breathing at six cycles per minute; HF, high frequency oscillations; LF, low frequency oscillations; Nitro, nitroglycerin; +Nitro, Nitroglycerin application during head-up tilt before (smooth lines) and after (Broken lines) bevacizumab infusion. Many efforts have been made to target the VEGF pathway in tackling cancer growth and tumor metastasis. Anti-angiogenic therapies using anti-VEGF antibodies or inhibitors of VEGF receptor 2 are increasingly employed in combination with standard therapy for the treatment of advanced cancer. However, predictive markers of efficacy as well as of toxicity have not yet been established. Imaging studies using diffusion contrast enhanced MRI (DCE-MRI) have documented very early changes in response to treatment with VEGF inhibitors [24, 25]. However, DCE-MRI technique currently seems too complex and expensive to be incorporated into large multicenter trials . Arterial hypertension is a candidate prognostic biomarker of response to VEGF therapy . One hypothesis is that VEGF inhibitors induce arterial hypertension by increasing vasoconstriction through alteration of nitric oxide (NO) bioavailability. Our method of dynamic analysis of flicker-light induced vasodilation, originally established for application in ophthalmological and cardiovascular research, was therefore used to describe the acute impact of bevacizumab administration on non-invasively measured retinal endothelial function in relation to blood pressure. We clearly demonstrate that anti-angiogenic treatment of colorectal cancer acutely reduces flicker-light induced vasodilation of retinal arteries independent of blood pressure changes. Furthermore, blood pressure responses to a nitrovasodilator were not altered by bevacizumab. The vasodilatory response of retinal vessels to diffuse luminance flicker stimulation is considered to be endothelium dependent through release of NO . Hence, a diminished vasodilatory capacity in response to flicker-light stimulation may indicate endothelial dysfunction. In line with our results, endothelial dysfunction was also reported by two other trials in cancer patients receiving either bevacizumab or telatinib - a small molecule angiogenesis inhibitor [10, 11]. In these trials endothelial function was determined by laser Doppler fluxmetry using pilocarpine  and flow-mediated vasodilation of the brachial artery . Although these methods measure endothelial function in different vascular beds it seems that the detrimental effect of angiogenesis inhibitors on endothelial function is not confined to a certain vascular bed and that arterial endothelial dysfunction is a general phenomenon of pharmacological angiogenesis inhibition. This is not surprising considering that VEGF receptor 2, which confers the hypotensive actions of VEGF , is virtually expressed by all endothelial cells. It is however intriguing that we did not observe any functional change in retinal veins after bevacizumab administration. The lack of effect may be due to a marked regional and segmental heterogeneity in vascular endothelial function . Accordingly, it has been reported that shear stress elicits a smaller NO-dependent vasodilation in veins and venules than in their arterial counterparts even on the same segment . Therefore, the extent of possible changes in endothelium-dependent vasodilation induced by any stimulus may be inherently less pronounced in the venous system. Furthermore, it is not fully clear whether the endothelial NO-synthase is also modulated by VEGF signaling in the venous circulation and whether VEGF binding to its respective receptors activates the same molecular machinery than in the arterial system. Although VEGF receptors have been identified on endothelial cells of veins a differential pattern of signal transduction has been suggested along the vascular tree . Although elevated blood pressure or hypertension has been the most frequently documented side effect of anti-angiogenic treatment  we did not observe meaningful changes in blood pressure nor in short-term blood pressure regulation by anti-angiogenic therapy. The most probable explanation for this observation is that the frequency of blood pressure elevation is a function of treatment duration . From a range of phase II clinical trials the median interval to incident hypertension was estimated at 4.5 - 6 months from initiation of bevacizumab therapy [35, 36]. Under the assumption that there is a progressive evolution of hypertension during chronic VEGF inhibition our findings may imply that endothelial dysfunction is the first step in a sequence of deleterious events evoked by VEGF blockade subsequently evolving into clinical disease [10, 11]. In vitro and in vivo studies clearly demonstrated the role of VEGF in maintaining baseline vascular tone by regulating NO synthesis and prostacyclin release . Loss of action by blockade of VEGF signaling renders endothelial dysfunction highly possible. Consistent with our above postulation, we observed a higher frequency of an abnormal blood pressure profile at night after bevacizumab administration. Furthermore, non-dipping status after anti-angiogenic therapy tended to be related to a stronger impairment of microvascular function. Although the latter data were not statistically significant it still may support our hypothesis of a central role of endothelial dysfunction in the development of VEGF-induced hypertension. We must acknowledge limitations of our pilot study. The small number of patients precluded us from performing multivariate modeling for analysis of possible interactions, especially co-morbidities, nor from doing correlation analysis of results of functional vascular analysis with outcome data of anti-angiogenic treatment. However, it is important to note that the study design allowed for separating the effect of anti-angiogenic treatment from that of chemotherapy. We demonstrate that the anti-VEGF antibody bevacizumab acutely impairs endothelial function of retinal arteries irrespective of blood pressure changes. Hence, functional imaging of the retinal microcirculation seems a valuable tool to monitor early effects of anti-VEGF treatment. Considering the close relationship between therapeutic and side effects of VEGF blockade, flicker provocation of retinal vessels may be a valid predictor of therapy success and outcome. Focke Ziemssen and Tjalf Ziemssen contributed equally to this work. We thank Silke Prieur and Kristin Haink for their excellent technical assistance and are grateful to all patients for their voluntarily participation in our study. We acknowledge support by the German Research Foundation and the Open Access Publication Funds of the TU Dresden. The prospective BEVA-RET study was supported by the University Hospital Carl Gustav Carus (NCT ID: NCT00740168). The study was supported by the University Hospital Carl Gustav Carus. The funders had no role in study design, data collection and analysis, decision to publish, or preparation of the manuscript. Gunnar Folprecht received honoraries for lectures and advisory boards from Roche / Genentech. All other authors have declared that no competing interests exist. Additionally, Focke Ziemssen has received speaker’s fees or consultancy honoraria from Alcon, Alimera, Allergan, Biogen, Bayer, Pfizer and Novartis. MR performed the statistical analysis and drafted the manuscript. RH assisted in the statistical analyses. TZ, FZ and GF designed the trial. TZ, KT, GF participated in the coordination of the trial and revised the manuscript for intellectual content. GE and HR revised the manuscript for intellectual content. All authors revised and approved the final manuscript.